Due to lack of interest in the KReduCNC, I will be pulling it from my website starting in April 2019. I am in the process of doing a second pass at the KReduCNC. My goal is to keep the basic design the same, but change and upgrade some of the components to 1/2 materials. This would allow harder more durable components where needed. I also understand that some of you don't really have a way of laying out the drawings that I have provided, so I will be making available some paper and cardstock templates. Most of the changes will be molded into the existing pages. I will try where appropriate to mark any additions or changes. If you have already completed some of your parts, they will still work. I will also be taking a look into some changes to the electronics. In this series, I will take you step by step through building the KReduCNC here. 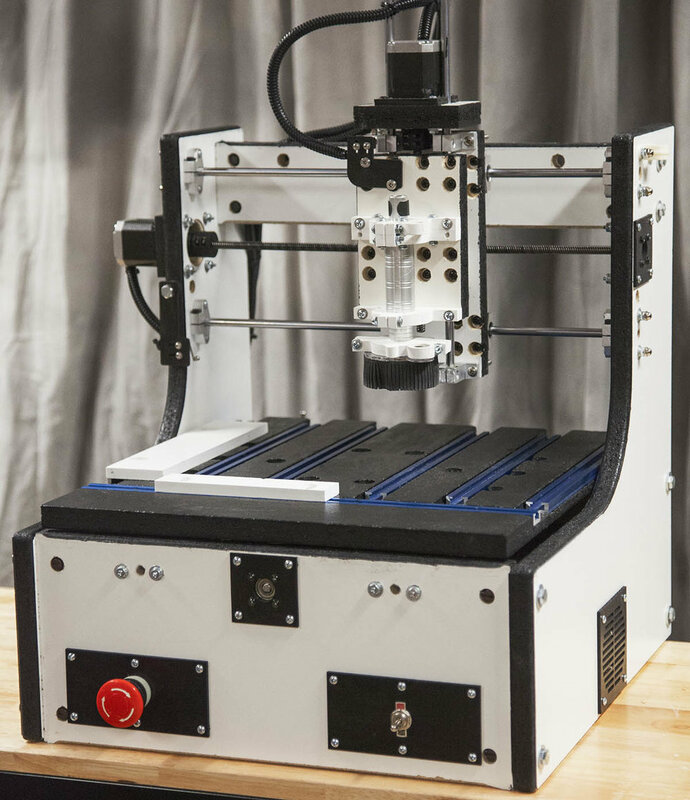 While you can follow along and build this CNC, you can also take the information provided in this series and design/build your own CNC. While I will be taking you through the build process, keep in mind that I have already built the KReduCNC. Search YouTube for “KReduCNC” and you can watch some of the videos I have posted on the KReduCNC. I was moving some boxes to the attic of my new shop when I picked up a box that had never been opened. The shipping label indicated it was from VXB. I have ordered several bearings from VXB in the past so I was a little excited. After opening the box, I found several 8mm rods, some bearings, and some mounting brackets. I keep a large supply of linear motion bearings on hand for my various experiments and research. They were probably ordered to replace some of the components I used on a 3D printer project awhile back. So I have a bunch of parts, now what could I build with them? I am often asked to do a talk or class on CNC machines, but my KRMx02 machines are too massive to leave the shop. I needed something smaller and easier to transport. Along with the parts in the box, and looking through my spare parts, I came up with following parts that could be used to build a small CNC. I had always wondered if unsupported 8mm shafts could be used in a CNC machine. This would be the perfect time to find out. If the build worked out, I would also have a small machine that I could throw in the back seat of my car. And so the idea for the KReduCNC is born. I chose the name KReduCNC as the build would be educational to others and help them understand the basics of a fixed gantry design CNC design. Due to the lightweight components used, this machine is not meant for heavy routing. It works well with soft plastic and wood, but its ability to mill aluminum is limited. The actual spindle used will also dictate the kinds of cuts that can be taken with this machine. The following are the goals I came up with before I started the design. Note that the moving table allows me to build a fixed gantry, which is a more rigid design than a moving gantry. Since I am using only 8mm rods for support this is the only way to go. If I didn’t do this, the Y-axis rods would have to support the weight of the complete gantry. This would cause them to sag in the middle. Using the components on hand along with some scrap 8020 aluminum, I built the first KReduCNC1 shown here. In addition, I took the machine out for a spin at my local Woodcraft. I was able to transport the machine easily by myself. Since the first build was only going to be a proof of concept, I knew it would be nowhere close to the final design. Normally when I design a new machine I do several iterations. With each new build making improvements on the last. The machine was an overall success, but it was a little heavy and had no place to mount the drive controller and power supply. I decided to add the following goals to the project based on knowledge gained from the proof of concept. Frame must be large enough to hold the controller, power supply, computer interface. Must have at least 10” x 8” cutting area. The design for the KReduCNC1 was done using Autodesk Inventor. This gives me an easy way to create illustrations and drawing files for this project. An exploded view of the design is shown here. The final design ended up with a 11” x 9” cutting area. Composed of two identical side panels with separate front and rear panels. A brace is also added to the top. Sufficient cutouts are added for future updates. In my build I used melamine coated particle board. The design supports any 3/4” material. 18mm baltic birch works as well, but can be pricey. The Y-axis consists of two 8mm rods running between the front and rear panels. Sitting on the two rods are four trucks that will carry the load of the table. The X-axis consists of two 8mm rods running between the two side panels. Four trucks and a plate will complete the X-axis and support the weight of the Z-axis and spindle. The Z-Axis consists of two 8mm rods attached to the X-axis plate. Four trucks attached to the rods support a Z-plate that is used to attach the spindle mounts. The X, Y, and Z are driven by three NEMA 17 motors, a 5mm to 8mm coupler and an 8mm nut. The spindle mount is cut from a piece of 3/8” expanded PVC. It could also be made from 9mm baltic birch plywood. The spindle mounts shown in the exploded view were cut to fit a Proxxon MICROMOT 50. The controller is a very inexpensive 3-axis controller that I have used on other small builds. Both the controller and power supply are mounted under the machine, on a platform that isolates them from any debris crated by the machine. You will need at the very least a small drill press to accurately drill the holes on this build. It is important that they all be perpendicular to the component in which they are placed. For cutting the actual components a Jigsaw can be used as long as the top and sides of the components are square. A small table saw would make the job easier but is not required. You will need a small and large phillips screw driver and various allen wrenches to tighten grub screws used on the couplers and brackets. A 5/16” and 7/16” wrench will also be needed for some of the bolts that are used. For measuring a small square and a digital caliper will help you tune things later in the build. A volt meter and soldering iron may also come in handy later as well. The KReduCNC is a work in progress. I have provided enough information to build this CNC. In time I will post component upgrades as well as additional files for some of the existing components. If you decide to build the KReduCNC and get stuck because I have ommited something, please contact me via this site.